If you are in the electronics industry or about to be connected with one, you will realize the importance of Printed Circuit Boards, popularly referred to as PCB. A PCB works both mechanically and electrically in connecting the electronic components. It does so by using conductive tracks, pads and other elements that are etched from copper sheets laminated onto a non-conductive substrate. However, the more advanced varieties of PCBs, such as the one offered by a recognized PCB manufacturer in China Shenzhen, have the components embedded in the substrate itself. The product can be single-sided or double-sided though the latter variety makes way for much higher component density. Before you seek the services of a good PCB manufacturer in China Shenzhen, it is better to look into and understand the basic design scheme that goes into it. At first, the component is schematically captured through an electronic design automation tool after which the positions of the same are determined based on heat sinks. The case of the PCB and the circuitry that it requires are taken into account to decide on the card dimension and the template. Towards the end of the design phase, the signal traces are routed and the Gerber files are, thereafter, generated for manufacturing. The electronic engineers working with a reliable PCB manufacturer in China Shenzhen take each aspect into careful consideration and use advanced components to ensure that the end product is highly effective in serving its purpose. If you are on the lookout for a trusted PCB Manufacturer in China Shenzhen, here is an industry leading name with the offer of great products for you. 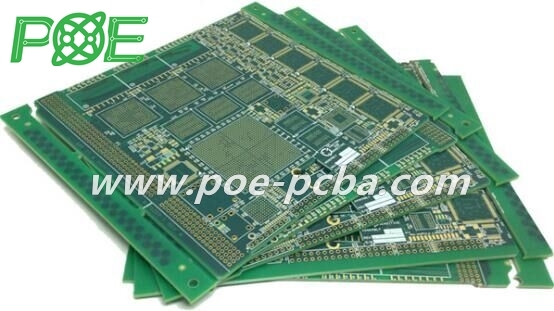 Established back in 1996, POE has been standing out as a reputed PCB manufacturer in guangdong with 3 plants, 1 R&D PCB Institution and the promise of a range of high-tech PCB products. The company has an annual production capacity of about 15 million square feet and it aims at helping clients overcome their technology challenges in an affordable and prompt way. POE currently has over 2000 domestic and international customers including Haier, Siemens Medical and Molex to name a few. The company offers express delivery, which promises an excellent 24 hours turnaround time on double-sided PCBs and 2-4 day turn available for up to 10 layers. Additionally, CRM system for clients who need immediate access and door delivery services by means of international freight courier solutions are also facilitated. For high-tech PCB products that never disappoint, contact this PCB manufacturer in China Shenzhen today!